Making the transition from a hobbyist travel blogger to a professional travel blogger is a difficult one; not only do you need to have excellent photography and writing skills, but you also need a captivating website that draws your audience in. While your average WordPress theme does a decent job of setting up newcomers with a starter site, to make an impact on your audience and keep them coming back for more, you need a custom WordPress theme. Custom WordPress themes add features such as threaded comments, sticky posts, multiple columns and even custom backgrounds; after setting up your theme, your website will rival those of professional travel companies. Below, you’ll find 30 of the Best WordPress themes for travel bloggers, each one loaded with amazing features that will rocket your website straight into the indexes of Google and Bing. Don’t forget to check out our best WordPress themes for photographers too! If you’re looking for a WordPress theme for your travel agency, look no further than the Bon Voyager WordPress theme. This responsive, Retina-ready theme makes your pictures look beautiful on any device, while the theme’s integrated Google Fonts library gives you a multitude of style choices for your blog posts. The Bon Voyage WordPress theme’s MotoPress Editor tool makes customization as easy as dragging and dropping: no coding is necessary to take advantage of this theme. Unlike other WordPress themes, the Bon Voyage theme includes both stock photos along with 24/7 customer support. A travel blogger’s worst nightmare is making a tiny change that brings his entire site crashing down around them; with the Travelop WordPress theme’s live preview panel, this worry is a thing of the past. The Travelop WordPress theme lets you view any changes to the theme in a preview window before the update goes live, allowing you to catch any mistakes before they happen. You’ll love having the preview panel available, as you’ll be making a lot of changes to this theme to take advantage of all of its great features, including social media integration, drop-down menus and Google Fonts integration. If you’re a travel blogger who is always tinkering with his site, you’ll love the customization options found in the TripTastic WordPress theme. Not only does this theme comes with a broad range of premium widgets at no additional cost, but it also includes Google Fonts integration and social media integration. This theme is cross-browser compatible, meaning it will work on all the major Web browsers including Internet Explorer, Firefox and Google Chrome. If you own multiple travel blogs, you’ll love that this theme is fully compliant with the GPL 3.0 license, meaning you can use it on an unlimited number of websites. When you’re ready to take your travel blog to the top search results of all the major search engines, you’ll want a WordPress theme like Travel Guide. This WordPress theme prides itself on being SEO ready, meaning that with the right keywords and engaging content, you’ll soon find yourself doubling and even tripling your readers. This theme will keep your readers on your website longer thanks to excellent features such as a filterable portfolio, multiple color options and custom widgets. The Travel Guide WordPress theme also offers a lifetime of free updates with your purchase. 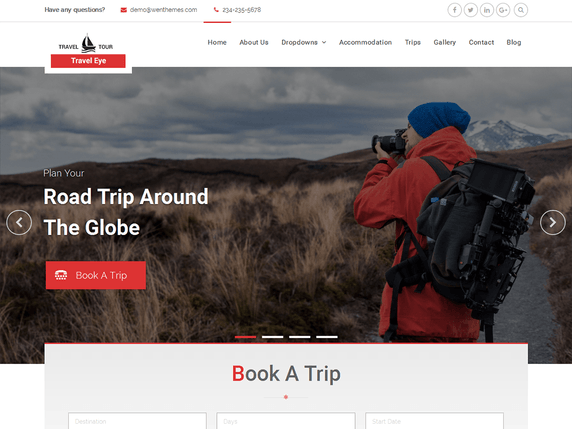 At first glance, you may think the Travel Agency WordPress theme is only suitable for travel agents; however, your average travel blogger will also get a lot of mileage out of this WordPress theme as well. The Travel Agency WordPress theme allows for large photos to display on your site, allowing your readers to get lost in your travel photos. The gallery feature on this theme lets your readers view multiple images at one time; in addition, you can also customize your slideshows with your company logo. Also included with the Travel Agency WordPress theme is a built-in contact form, giving your readers a quick and easy way to get in touch with you. 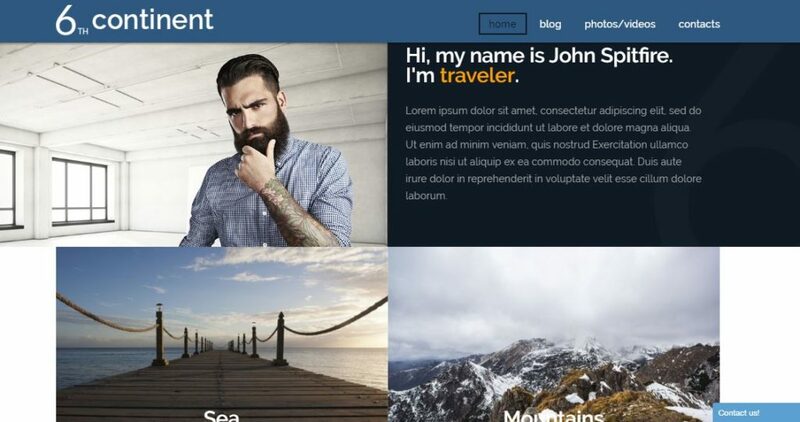 The 6th Continent WordPress theme is all about satisfying your users. For starters, this WordPress theme is fully responsive, meaning that no matter what device your readers use, your website will look beautiful. Secondly, the 6th Continent WordPress theme is multilingual ready with support for over 10 different languages, including Russian, German and French. The 6th Continent WordPress theme is also about satisfying the user as well, coming with over 80 shortcodes, support for custom post types and support for parallax scrolling. The built-in theme customizer will allow you to make the 6th Continent WordPress theme your own by letting you customize nearly every inch of it, right down to the footer. The Dream Travel Club WordPress theme welcomes your readers to your blog from the moment they first visit your site, thanks to the large welcoming slider that displays high-resolution versions of your photos. Once your readers stop gawking at your initial pictures, they’ll stay for your content thanks to this WordPress theme’s responsive design, minimalist look and parallax effects. The Dream Travel Club WordPress theme also boasts quicker loading times compared to other WordPress themes, offering load times of under a few seconds even on older devices. 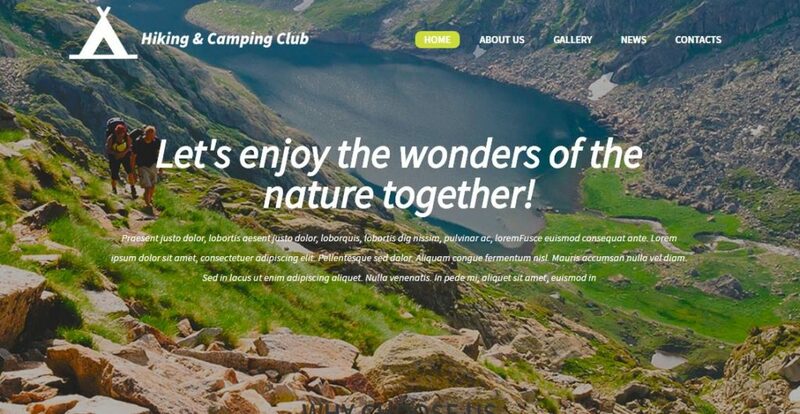 If you’re a travel blogger who loves the great outdoors, then you’ll enjoy the Camping WordPress theme. This WordPress theme places an emphasis on pictures over the written word, perfect for travel bloggers who prefer to fill their blog full of photos. Whether you’re a writer or a photographer, the custom post types give you the freedom to turn this WordPress theme into whatever you need, with post types ranging from simple images and galleries to audio posts and video recordings. The simple two-step installation process means that you’ll spend less time setting the Camping WordPress theme up and more time blogging about your adventures in the wild. Like the SKT WordPress theme, the MagXP WordPress theme uses a magazine-style layout; however, if you found the SKT WordPress theme too complicated to use, you’ll love the accessibility options that the MagXP theme provides. The MagXP WordPress theme uses drag-and-drop technology so that even novice WordPress users can create a beautiful looking site in a matter of hours. 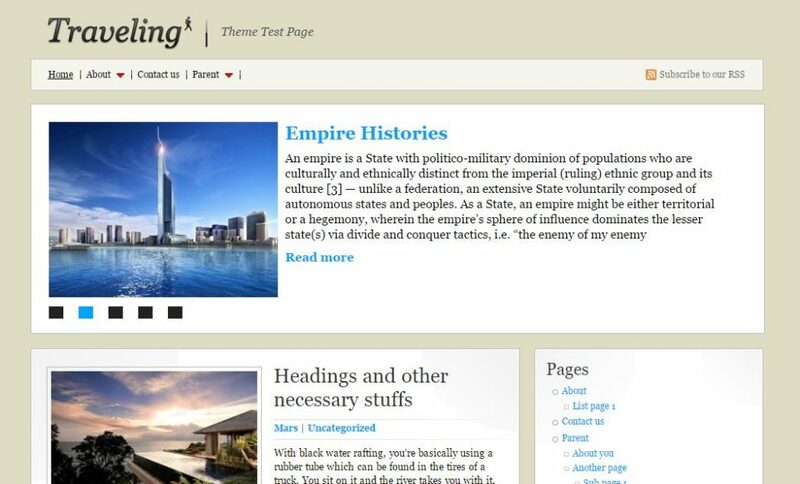 With four pagination styles, unlimited sidebars and unlimited layout possibilities, no two sites that use the MagXP WordPress theme will look alike. The customization options don’t end there, as the MagXP WordPress theme also includes over 630 fonts and 15 widgets. Lastly, this WordPress theme includes a review system that gives your readers the power to add both ratings and reviews to each post on your blog. The Schema WordPress theme prides itself on two things: incredibly fast loading times and SEO friendliness. Every inch of the Schema WordPress theme is built with SEO in mind, from the rich snippets that help search engines rate your website higher to the theme’s layout, designed to tell search engines instantly that your travel site is a blog. What this translates to is more readers, higher ad earnings and the potential for your travel blog to become a household name. When you’re ready to turn your travel blog from a hobby to a career, the Schema WordPress theme is a necessity. While the Traveling WordPress theme may have a simple name, this WordPress theme is anything but simple. Not only does this theme feature SEO implementation, support for widgets and threaded comments, but it also features multi-level drop-down CSS menus, PSD files and support for gravatars. Also included with your purchase is extensive documentation covering everything from installation to the more complex customization settings. If you have any questions, the developer himself is available via email to offer you as much support as you need. If you’re looking for your travel blog to double as a tourism blog for your hotel, tour or travel agency, then look no further than the Trendy Travel WordPress theme. In addition to offering a full blog area, this WordPress theme also provides forum functionality, unlimited layout options, a multitude of shortcodes and even WooCommerce integration. With support for custom post types built directly into this theme, you can vary your blog posts between the written word, photographs and videos. The advanced search feature of this theme lets your readers find the content that is relevant to their interests, perfect for travel bloggers who have accrued a massive amount of content over the years. Like most WordPress themes for travel bloggers, the Penamoo WordPress theme is a fully responsive theme that offers a variety of customization options. However, the Penamoo WordPress theme puts an emphasis on retaining your readers longer using features like the custom related post feature. This feature lets you manually choose the related articles that appear on any given piece, rather than relying on algorithms. Travel bloggers who specialize in photographs will love the portfolio options available within the Penamoo theme, such as being able to write a short paragraph under each displayed photo. 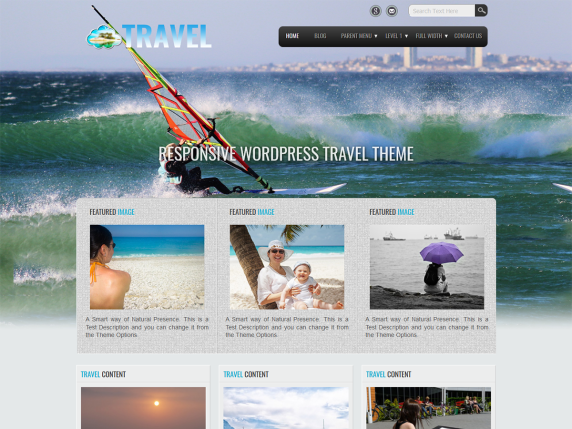 Travelista is a WordPress theme designed by travel bloggers, for travel bloggers. While other travel blogs limit themselves to one type of post, you’ll have a variety of post options at your disposal thanks to Travelista’s nine different post formats. From standard blog posts and galleries to quotes, audio posts and videos, your readers will love how each blog post is something completely different. In addition, the Travelista WordPress theme includes nine different layouts to choose from, virtually guaranteeing that no two sites that use this theme will look the same. The Redux Framework technology that powers this theme provides a simplicity that novice WordPress users will love. The developer behind the WPVoyager WordPress theme claims that it was made with the traveler in mind, and it only takes one glance at this theme to see that this statement is 100 percent accurate. 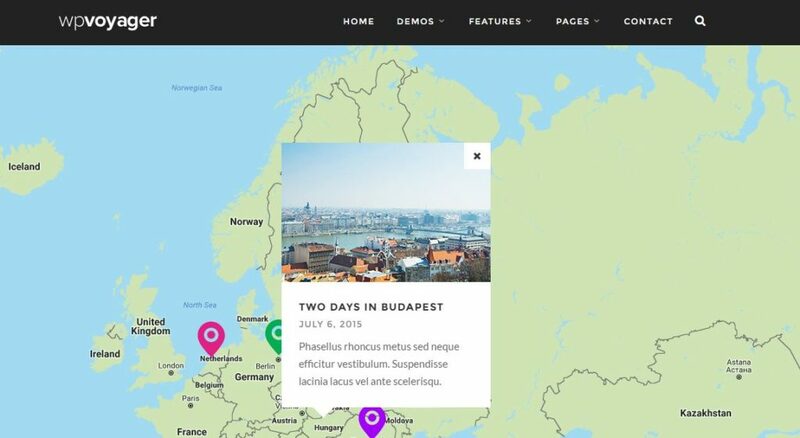 What sets the WPVoyager theme apart from your average WordPress travel themes is its Google API integration, letting you display a map on your blog so your readers can follow your journey in real-time. In addition, this theme also has KML support built into it, letting you add image overlays and other data to your maps. With the WPVoyager WordPress theme, you’re never traveling alone. 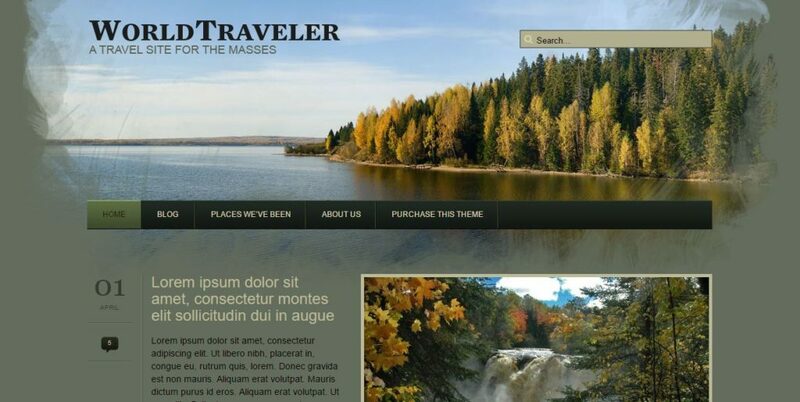 If you love customizing, you’ll love the WP World Traveler WordPress theme. For starters, this WordPress theme features a custom theme administration panel that lets you edit every part of the home page, from the widget locations to the logo. When it comes to creating a blog post, the WP World Traveler WordPress theme does a majority of the work for you; for example, the dynamic image resizing tool will automatically resize your uploaded images. If you’re planning on focusing your travel blog on photography, you’ll love the built-in Flickr widget that comes with this theme. The Wild WordPress theme is perfect for travel bloggers who are looking to get the most bang for their buck. Included in this theme for no additional cost are interactive world maps, a drag-and-drop page builder and a premium revolution slider: a value worth over $60! The features don’t stop there, as this theme also comes with over 670 fonts, unlimited sidebar options and even CSS3 animations. With professional support available 24/7 along with free updates, the Wild WordPress theme has everything you need to make the ultimate travel blog. The Burouc WordPress theme is a modern, sleek theme on the outside and on the inside, it’s packed with options that make other WordPress theme green with envy. The custom Google Maps integration lets you accurately pinpoint to your readers where you’ve been and where you’re going, making them feel as if they are a part of your journey. The live customization window enables you to view changes as soon as you make them, which is perfect for catching any mistakes before the changes go live. This theme also features social media integration, a grid-style layout and over 10 home page variations. 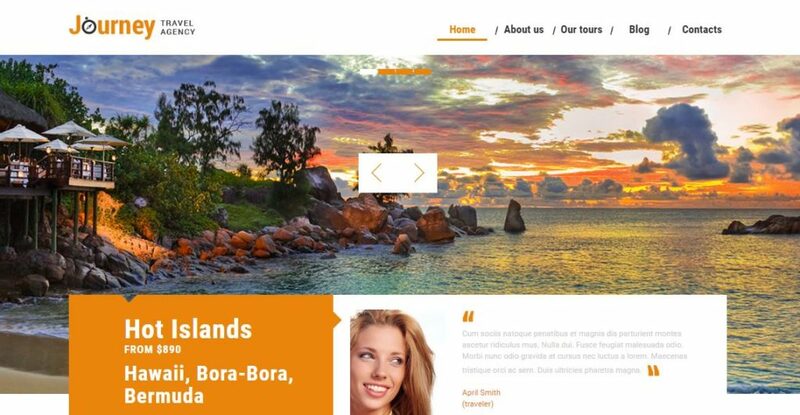 With the Burouc WordPress theme, the only limit to your travel blog is your imagination. If you’re a lover of widgets, then the Your Journey WordPress theme is the ideal WordPress theme for your travel blog. This WordPress theme features over a dozen widgets, ranging from widgets that allow social media integration with your Facebook and Twitter profiles, widgets showcasing your latest posts and even widgets that add a banner to the top of your website. The Your Journey WordPress theme isn’t only about the widgets, as it also features a responsive design, a grid rotator, compatibility with WPML and a featured slider. If you’re worried that all of these widgets and customization options are too overwhelming, you can rest easy as the Your Journey WordPress theme comes with extensive documentation that goes over every inch of this theme in great detail. You don’t need to spend money to get a great theme for your travel blog. Ok, the free themes aren’t as great as the premium themes when it comes to user experience, design or functionality, but they are good for newbies who just want to get their blogs up and running as quick as possible and to use it as an entry level learning platform. Below I have listed what I feel are the best free WordPress Themes for travel bloggers. These themes I feel are good all rounders when you take into consideration look, feel, functionality and mobile friendliness. 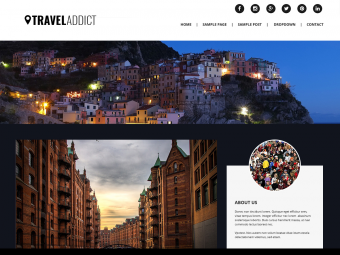 The TravelAddict Lite WordPress theme is a great theme for novice WordPress users, as it features a straight-forward installation and a small selection of features. This WordPress theme offers a clean, minimalist design, making it easy for both you and your readers to navigate. 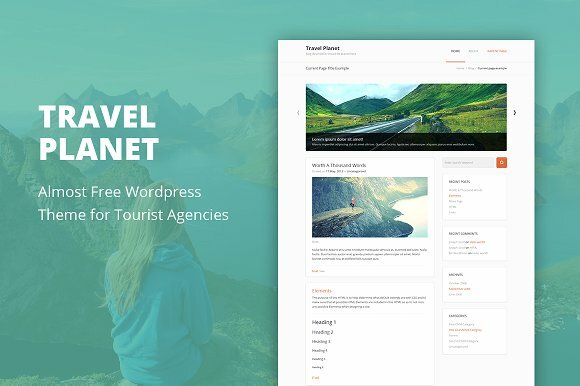 While the TravelAddict Lite WordPress theme doesn’t offer as many bells and whistles as other themes, you’ll still get features such as custom widgets, Google Fonts, color customization, threaded comments and even social media integration. While WordPress experts will likely want a more robust theme, if you’re just starting your travel blog then you can’t go wrong with the TravelAddict Lite WordPress theme. The Travel Diaries WordPress theme is a travel blogger’s best friend. The theme is fully responsive, altering its display to match the type of device the reader is currently using. The Travel Diaries WordPress theme keeps your readers in the loop about your travel plans, offering sections detailing your previous trip, information about your next trip and a record of the number of countries you have previously visited. 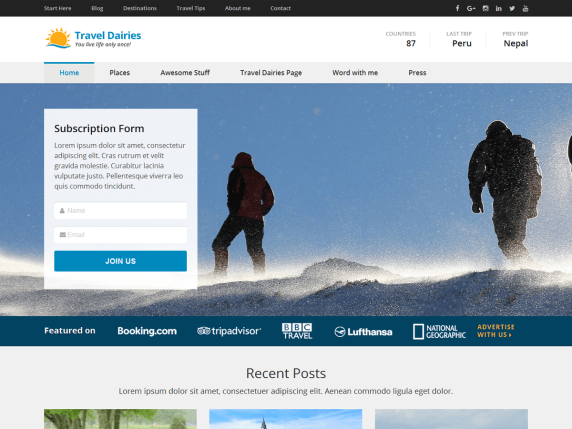 If you’re looking to make some cash from your travel blog, the Travel Diaries WordPress theme offers built-in advertising opportunities. Travel bloggers who are looking to reach a global audience will appreciate that this theme is translation ready. Travel bloggers come in all shapes and sizes, and while most travel bloggers are writers detailing their global adventures, some travel bloggers are looking to advertise a service. The Travel Eye WordPress theme is perfect for travel bloggers who want to blog about their travel agency, hotel or the tours they offer. The drag-and-drop customization tools found in this theme let even WordPress novices make it their own: If you can use a mouse, you can customize this theme! If you’re looking for an even greater degree of customization, the Theme Options panel features powerful tools that let you alter the Travel Eye WordPress theme down to its very core. 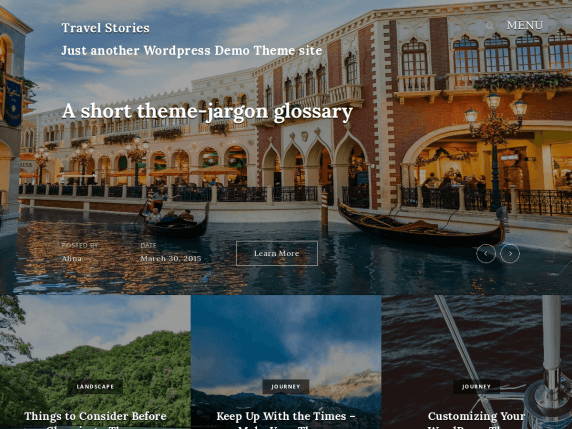 Whether you’re blogging about your adventures across the world or writing about the great features your hotel offers, the Travel Stories WordPress theme has something to offer you. The three-column layout is perfect for companies who want to get as much information as possible onto one page while travel bloggers will love the fluidity of the theme, as it makes it easy for readers to follow a story naturally. No matter which group you are a part of, you’ll love the amount of documentation the Travel Stories WordPress theme comes with. Lastly, the threaded comments feature enables your readers to comment not just on your blog posts but also with each other. The Travel Planet WordPress theme is a minimalist theme that places all the focus on your travel photos and musings. This modern and sleek WordPress theme doesn’t just look good, it also loads fast and adapts itself to your readers’ devices. The Travel Planet WordPress theme is also fully customizable, letting users tweak both the background, menus and header to match their brand. With the ability to place a sticky post, you can highlight your best blog article while the threaded comments feature lets your readers share their thoughts on each of your blog posts. Like the TravelAddict Lite WordPress theme, the Travel Lite WordPress theme focuses on minimalism in both looks and features. That’s not to say this WordPress theme is lacking any major features, as it still lets users create custom backgrounds and headers, create sticky posts and take advantage of a two-column layout. Like other WordPress themes, the Travel Lite WordPress theme also supports threaded comments and is translation ready. If you’re looking for a low-maintenance theme that still looks beautiful, then the Travel Lite WordPress theme is an excellent choice. 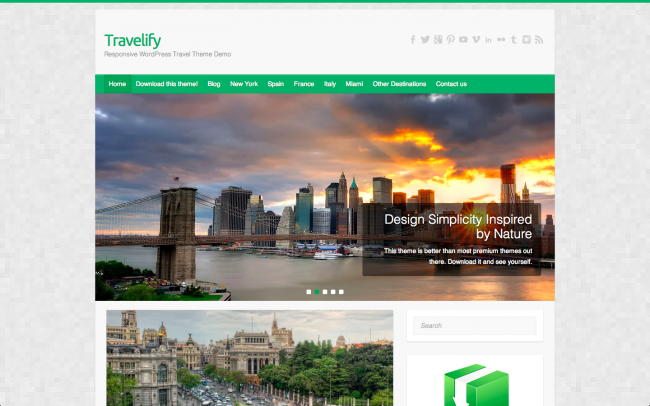 Like most WordPress themes, the Travelify WordPress theme is a responsive theme that adjusts itself to fit the device the reader is using; however, unlike other WordPress themes, the Travelify theme takes advantage of Retina displays. If you’re ready to make the leap from blogging about your trip to selling the items you find on your travels, you’ll love the fact that this theme includes WooCommerce support right out of the virtual box. This theme offers simple customization options that WordPress beginners will enjoy while also including robust customization options that WordPress experts can use to make this theme completely their own. The Travelify WordPress theme also includes social media integration, letting your readers post their favorite blog posts on sites such as Facebook, Twitter and Instagram. While the Barletta WordPress theme primarily sees use by fashion, food and lifestyle bloggers, some travel bloggers will love the elegant font and minimalist design that this theme provides. Designed using the Bootstrap framework, this WordPress theme prides itself on its stability, meaning you don’t need to worry about your site crashing while you’re jetting off to a new location. Whether your readers are using a PC or a mobile device, they will love how beautiful your website looks and how easy it is to navigate. 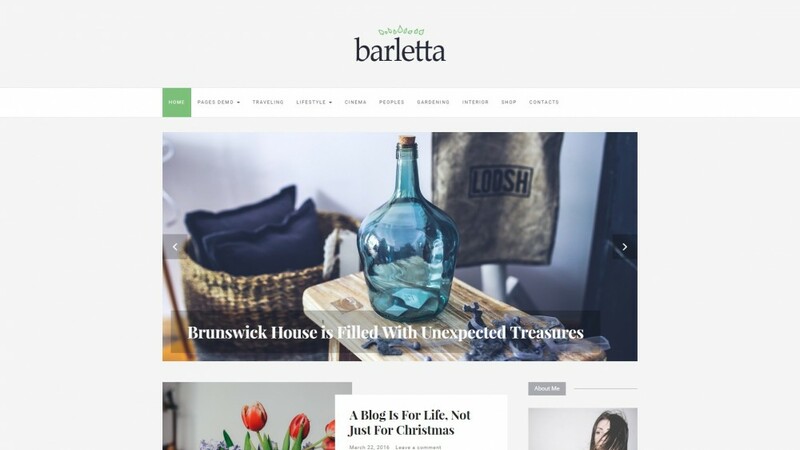 You’ll be writing in no time when using the Barletta WordPress theme as the installation of the theme only takes a few minutes. If you’re just getting started with your travel blog, a WordPress theme like Panoramic makes an excellent choice. No coding knowledge is necessary to customize any aspect of this theme, making it easy for even the most inexperienced WordPress user to learn the ropes quickly. If you do encounter a problem that you can’t seem to figure out, the developers of the Panoramic WordPress theme offer support that they classify as five-star support. 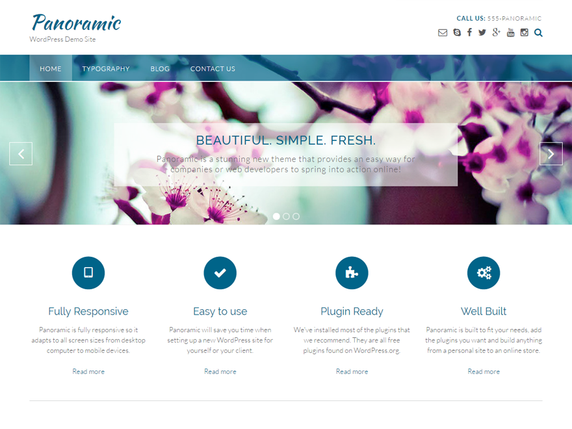 The Panoramic WordPress theme can grow and adapt to whatever changes you make on your blog, as it features support for widgets such as SiteOrigin’s Page Builder, Contact Form 7 and WooCommerce. Making your travel blog stand out from the crowd is one of the key components in gaining and maintaining readership. 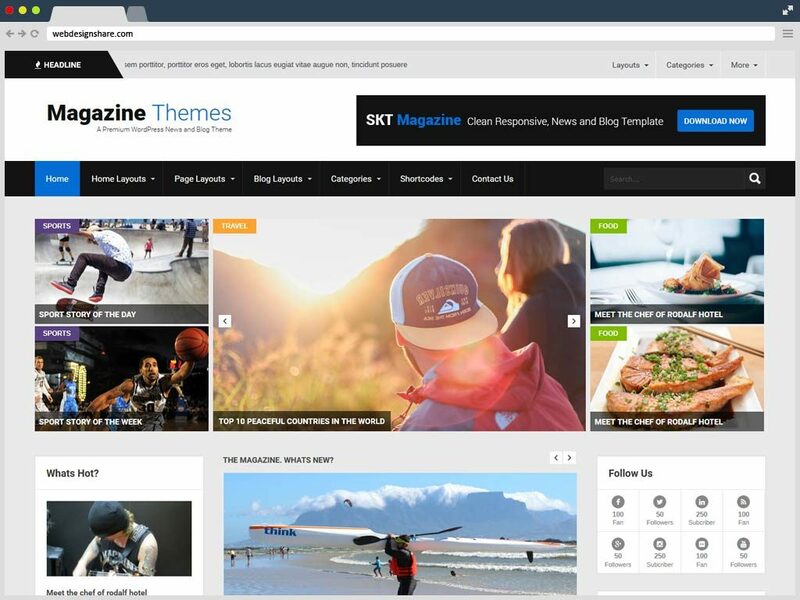 The SKT Magazine WordPress theme can make your theme visually unique with its magazine-style layout, letting your travel blog mimic the designs such as those found in National Geographic. This WordPress theme is an excellent choice for travel bloggers who prefer to let pictures tell their story, as it features compatibility with gallery and portfolio widgets. The SKT Magazine WordPress theme is also translation ready, giving you the ability to translate your website to over 10 different languages. This theme comes loaded with options, ranging from basic features such as custom menus and threaded comments to more advanced features such as a grid-style layout and compatibility with SEO widgets. Need Web Hosting For Your New WordPress Travel Blog? 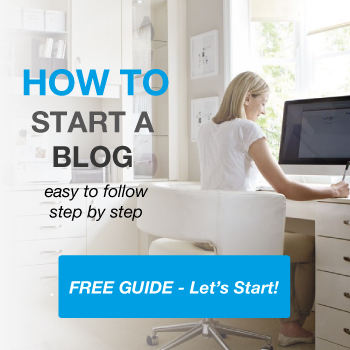 Then you need to check out my Best WordPress Hosting guide. Find out which hosts offers the best value for money when it comes to hosting your WordPress blog. Thanks for the suggestion Danial.